Bridges on the contract included Knockanboy Bridge, Cloondara Bridge, Fowlards Bridge, Owenroe Bridge, Siddan Bridge, and Lanesborough Bridge. A number of the bridges were located in Specials Areas of Conservation and Special Protection Areas so works had to be completed with this in mind. 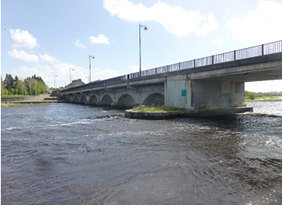 Owenroe Bridge was also a protected structure and so Part 8 Planning (with conditions) was granted by Meath County Council.